Weather Forecast: Fine and mild. It was a beautiful day in Mt Barker yesterday so I took the opportunity to revisit my current favourite plein air painting spot in Torndirrup National Park, Albany (Western Australia). 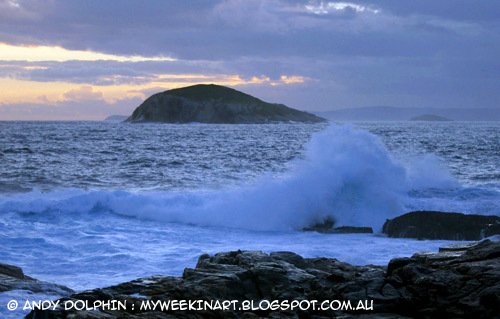 Mt Barker is 50km from the coast and Torndirrup is a 45-minute drive away. There's never any guarantee the weather will be remotely the same when I get there. But yesterday it was close-to-perfect when I arrived. It was warm and the breeze was light, so I could wear my brimmed hat to keep the sun out of my eyes, instead of my beanie (my ears ache when it's cold). And I didn't need to wear a jacket! Despite the mild weather, and although the sea looked calm out to the horizon, there was one hell of a swell thumping into shore. I spent a pleasant couple of hours watching the sea, taking photos and painting - and being amazed by the sheer force of some of the breakers. This painting was done about the same time of day as Wednesday's painting at the same place. I've chosen a slightly different position so that I'm not looking so directly into the setting sun for this one. I wanted good lighting but not glare. I also went in with a better idea of what I wanted the end result to be, before I began (I've observed this spot quite a lot over the last couple of months). I just had to look for the information to make it work and try not to get distracted by other amazing things that happen in the chaos of breaker after breaker. Here's the compulsory "I really was there when I painted this" shot. You can get some idea of how bright the light was toward the end. I did a little more work after this photo was taken. I approached this one, initially, as a very-quick-sketch, throwing large patches of base colour into the major tonal areas. Then I worked over all areas bringing them to some level of completion. It's still pretty loose though. I'll post a proper pic of the painting when I get a chance to take a photo in decent light. 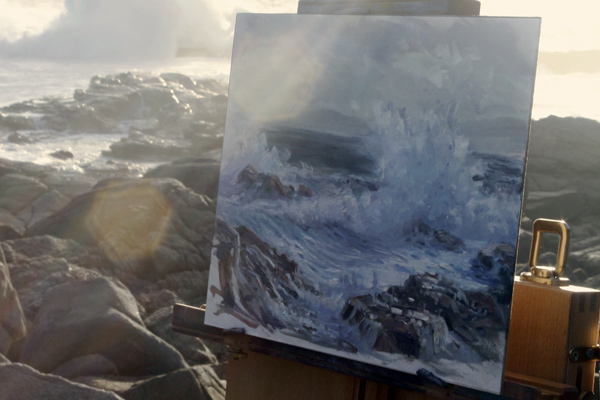 And here it is plein air seascape sketch in oils. These plein air works are a part of my evolution of a seascape in oil series. All the experience I gain from painting on location, in various conditions, will feed in to the end result of that effort. I'll be going back to the same spot a few more times yet. I was hoping to get there today but life, and a rather large storm, got in the way. And, once again, the photo at the top of the article is how the place looked while I was packing up. It really is a shocking way to live.